I am a flop called Fondation Charles Dunfour on Rue de Chance; the guidebook says Rue du Mosque. I am in a different country, therefore a different guide writer; nonetheless, this writer’s maybe does not have a car and is more ready to forgive than the Ghana writer not on a budget. I am in love with this Hostel for one night, and I will kiss it goodbye today and say hello if I see her again. I will not exchange numbers. There are two French Girls in one of the room who brush and combs each other’s hair, to other French Girls in the dorm beds I think, and another French guy named Thomas. Thomas is the only person, who speaks English, and his English is great, they do not seem to smoke… strange? There is literally one of the 5-7 various boys flopping on the floor just beyond he swing of my room door. I woke at about 4:55 am, did the SOP walk to find a switch to the John, and find some water for coffee. Upon return to the room, I used a pillow from the bed with no pillowcase to block the three 2-inch gap under my single room door. I know the light from room would glare into his eyes on the floor and possibly wake him, I hope. 5 Men and 2 Girls from some African Country, I hope Burkina Faso living in the Hostels. 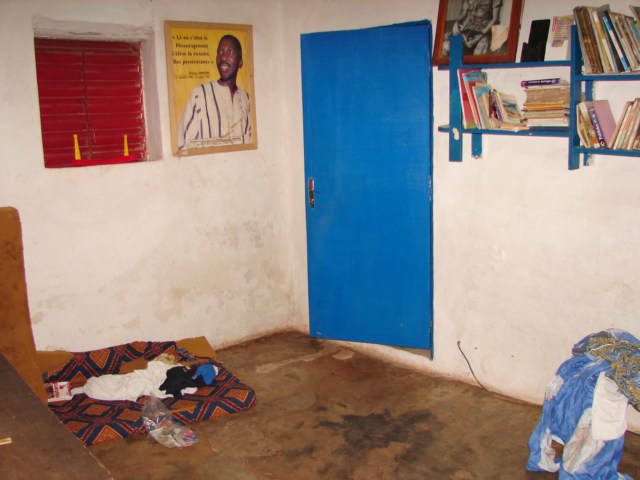 A single room is 5000-6000 CFA or 10-12 U.S. Dollars. A dorm bed with a mosquito net on the bed is I think 3000 or 6 US Dollars, my room did not include a Mosquito net, the hotel is one short, so I pay more and have none, go figure. This is a “We are in this Together Hotel,” so we all overlook and look the other way and pretend. The French girls are in Africa to visit one country, and Thomas is visiting two. He said to me, “The Hotels are very expensive, yes?” I then taught him some curse words in English to expand on his vocabulary in agreement. It has been ages since I have stayed in a Hostel or Hotel like this, it reminds me of a place long long ago in Managua, Nicaragua. The Managua place was great, full of Peace Corps not at their village as normal and Israel people, and one exceptional Israel girl named Maya, she was a dream that did not come true. The room was about the same quality; a lizard climbed in my room and ate my bread in a plastic bag hanging on the wall no less. The room was one dollar. I closed the window here; the only guaranteed of nothing crawling in, however, there is a two going on three-inch gap under the door I cannot lock because it has expanded due to moisture. This room is 10 US dollars, my room in Po comparable for 8, but with a mosquito net in Po. I walked back to the Hotel Oiseau Blue diagonally across from the Rakieta Bus Station three times yesterday. The vendors in front of the station are the only ones selling food in this area on Sunday. The neighborhood is very organized, the grid system of wide streets, the traffic is not too bad, and all is easy. The red clay sand is covering the city in a slurry of mud today, as it has been raining nightly. 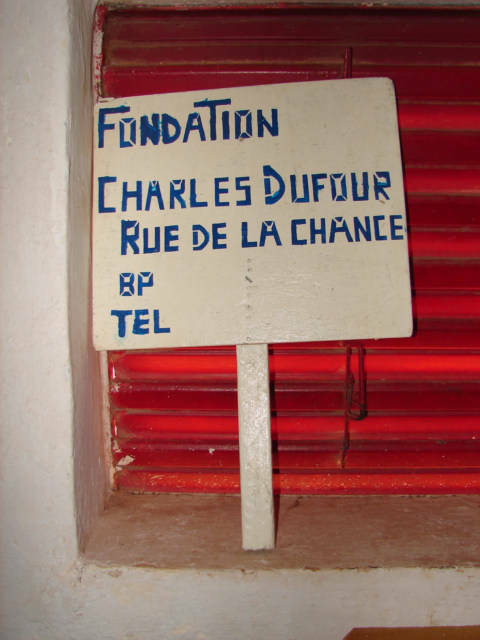 I paid 10 US dollar for the experience and money well spent to live in the Fondation Charles Dunfour Hostel here in Ouaga, Burkina Faso, and I would suspect if Charles is alive, he is doing well from the proceeds, as the cost of proving services to income is a good gap. Everyone should stay in a Hostel like this one time in his or her life, they can be either at home or hell, but they are for sure a trip to somewhere. This type of Hostel with the correct people inside can be a joy to live in, the camaraderie makes the “we are in this together” help you to forget you are in a flophouse in and industrial wholesale section of town. I really wish all the French were smoking as normal… it would make all more SOP and in the right Frame. I cannot remember, I think it is called Crystal Hostel in Accra Ghana was a challenge for worst over-all value for the buck. It was also a “We are in this together Hostel,” very low utility value, also located on the wrong side of the tracks. I think if I lived in this Hostel long enough, a local girl would say, why are you living in that neighborhood don’t you know it is the wholesale industrial area. About 5 blocks directly east of here is a large modern street with a few good place to hide, and way to expensive hotels. It is where I will go to use the internet, and then retrieve my backpacks that are locked to the table because the room will not lock, and scoot on down the road to a city named Bobo, surreal and real. My fan is quiet, a benefit.